A 19-0 run to end the first quarter powered the Heat women's basketball team to an exciting (72-47) win at Immaculata on Friday night over VIU. KELOWNA, BC — The UBC Okanagan women’s basketball team kick started their preseason with a 72-47 win against the VIU Mariner’s this Friday night at Immaculata high school in Kelowna. With the win the Heat begin their 2016-17 campaign with a (1-0) record while dropping the Mariners record to (0-1). 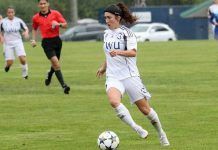 With a smattering of new players on the roster and Claire Meadows starting her second season as head coach for the Heat the Kelowna squad kicked off the first quarter with eager competition as VIU began with a 5-2 run. With this run the Heat were quick to fire back and were able to match the Mariners run and then go on a 19-0 scoring streak to finish the first with a lead of 21-5. The balanced UBC Okanagan scoring attach was led by fifth year Chloe Kennedy, the only UBCO player to reach double digits. She finished with 12 points and four rebounds. Rookie Nicole Hart led the team with six rebounds playing on a familiar court, the Immaculata grad added wight points in her first UBCO outing. Another freshman Emma Jonas also scored her first points in Heat gear, finishing with seven. All players on the UBCO bench played and made an impact in the game putting the score at 38-19 at the half. The other Immaculata grads playing on their high school court, Emma Jonson and Olivia Johnson finished with seven and two points respectively. The team approach on offense and strong defense carried into the second half. The Heat were able to build chemistry and get into a rhythm on both ends of the floor closing out the Mariners on offense on multiple plays and took the lead to 55-36 by the end of the third. As the fourth, similar to the rest of the game saw speed and a competitive edge by both teams the Heat were able to control the hardwood and finish the game with a 72-47 win. With tonight’s win the Heat women’s basketball team will be looking to maintain a perfect record as they play VIU tomorrow (Saturday Oct. 1) at 1 p.m. at the UBC Okanagan gymnasium.